Residents of South Northants district are being encouraged to show their love for recycling this Valentine’s Day. South Northamptonshire Council is reminding residents to consider the environment by correctly disposing of any flowers, recyclable rubbish and food waste from their Valentine’s Day celebrations. Once past their best, flowers can be placed in the green garden waste bins to be taken away for composting, which is then used by local farms. Leftovers and peelings from home-cooked romantic meals for two should all be disposed of in the silver food caddies. Food waste that goes to landfill is harmful for the environment, because as it breaks down it produces methane, a climate change-affecting gas that is 25 times more damaging than carbon dioxide. Leftovers and food waste that go into caddies can be taken to a special recycling plant where it is turned into electricity that feeds back into the national grid and used to power homes. Old Valentine cards (without glitter or other adornments such as ribbons), cardboard from chocolate boxes, glass bottles and plastic packaging (but not plastic film such as shopping bags) can also all be recycled by using the blue bins. Please make sure any polystyrene or bubble wrap packaging is removed and placed in the black bin. District households have alternate weekly collections of mixed recycling (blue bin), garden waste (green bin) and rubbish (black bin). In addition, most households have a weekly food waste collection from silver caddies. If you live in a flat South Northamptonshire Council provides shared bins for rubbish and recycling. More information on waste and recycling is available on the council’s website or by calling 01327 322344. 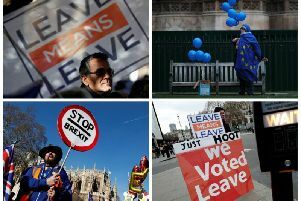 How did Northamptonshire MPs vote on Brexit options?